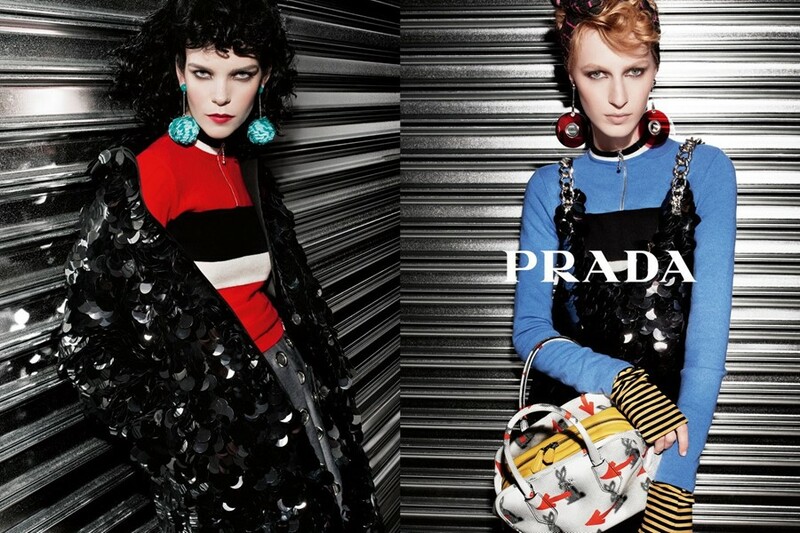 Following in the wake of the house’s SS16 show, Prada has unveiled its Resort SS16 campaign. Photographed by Steven Meisel, the “series of informal portraits” stars Dazed cover star Lineisy Montero, along with Lexi Boling, Meghan Collison, Ina Jensen, Julia Nobis and Greta Varlese. For Montero, who walked 68 shows this season, it’s her second Prada campaign – the Dominican starred in the house’s AW15 visuals, also photographed by Meisel. In these images the models are shot against a roller shutter, as if they are queuing outside a nightclub, so they resemble something akin to 80s club girls. In fact, they wouldn’t look out of place in a book by Derek Ridgers, who photographed London youth in the late 70s and 80s. “Pop decorativism is subverted by industrial minimalism,” reads the press release, which also pays “post-modesty” a mention. Described as the “new normcore”, this term was coined by Miuccia Prada at Prada’s SS16 men’s show, where this collection was first unveiled.